2. Click on the Assess option. 3. Locate the appropriate Pending Assessment, and click on the Student's name to select Transfer. 4. Use the Assessor drop-down menu to select the Assessor who will assess the work. Alternatively, you can choose 'Same Assessor' to ensure that you will assess the transferred assessment. 5. 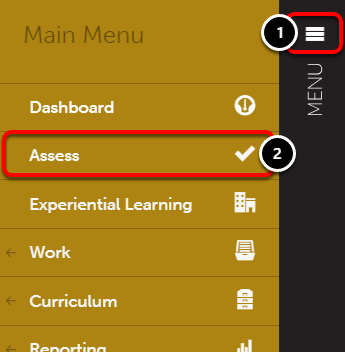 Use the Choose Instrument button to select a new assessment instrument for the transferred assessment. 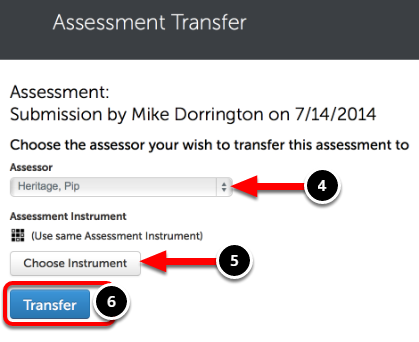 Alternatively, you can skip this step so that the transferred assessment will use the same instrument.